Toy electric trains have been identified with the Christmas season for nearly a century. How did these miniatures from the world of transportation become icons of the winter holiday season? There have been toy trains since the first real railroads came into being. However in 1891 the German toy company Marklin introduced a new product. Not just a toy train, but a toy train set. A complete system including locomotive, cars and track all scaled to a particular size. The idea was that this would be part of a line of toys to which you could add accessories, like extra cars, different locomotives and miniature buildings. It turned out to be a real boon for Marklin as it encouraged buyers to come back again and again to purchase more items to add to their tiny worlds. These early train sets were made of soldered tinplate and were driven by a windup mechanism which gave the operator little control over the engine and cars other than to crank the key and let them roll. Still, they proved very popular and companies in Britain and the United States soon followed, building their own toy train sets. The Germans dominated the market, however, until the onset of World War I. After that, anti-German sentiment allowed domestic manufacturers to increase their market share at the German's expense. In the United States the toy maker Ives was one of the first makers of toy train sets. These sets featured a windup-clockwork mechanism driving an engine and cars made out of cast iron. Ives put together a successful advertising campaign aiming at what they felt was their target audience: 12 year-old boys. They managed to build brand loyalty and became perhaps the largest manufacturer of toy trains in the United States by the beginning of the 20th century. Other toy inventors, however, were pondering how to get past the limits of the clockwork mechanism. 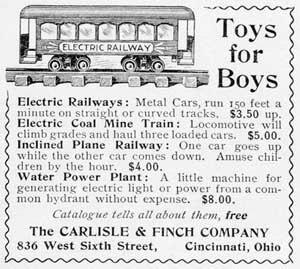 In 1897 the U.S. company Carlisle & Finch started producing an electric toy train that ran off batteries. Strangely enough, the only other product produced by the company was a carbon arc searchlight. The trains did well, but as the United States entered into World War I, the government forbade the company from producing the toys as Uncle Sam needed the business to concentrate on building spotlights for the war. After the conflict was over, Carlisle & Finch decided not to resume their toy train production. Today they remain a premier vendor for search lights and related equipment. Ives electric trains from the 1920's lined up in their showroom for a publicity photo. There were others, however, ready to step into Carlisle & Finch's shoes. In 1900 a new company was founded whose name would be forever associated with electric trains: Lionel. When Lionel Corporation was started by Joshua Lionel Cowen and Harry C. Grant in New York City it was not their intention to build toy trains. They saw the company as making a number of electric novelty devices, the first one being a fan. As part of an advertising ploy, Cowen took one of the fan motors and used it to power an electric train that ran on a battery. The idea was that a moving miniature train in a store window would draw attention to the other products. However, store owners got more inquiries about buying the train than the fans and Lionel soon added toy railways to their product line. Eventually it became their main business. Lionel electric trains became so popular that Ives was forced to come out with its own electric trains. By beginning of the 1920's, Lionel, Ives and another company, American Flyer, were battling it out for the biggest share of the U.S. electric toy train market. 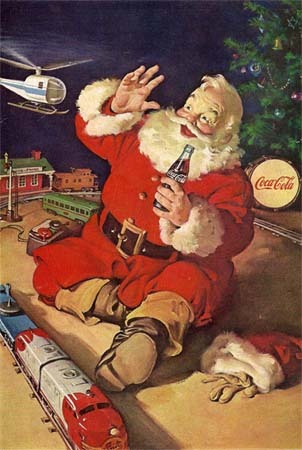 An ad campaign from the 1950's connecting Christmas to Lionel Trains. (Courtsey of Lionel LLC). All toy trains are some fraction of the size of a real train and that ratio is known as the "scale." The most important part of the train's scale is the "gauge" or the size of the track it runs on. If the train does not properly fit the track, it will derail. Having trains fit a certain gauge also means that they will be interchangeable, allowing the engine and cars from one manufacturer to run on the track of another manufacturer. By the 1920's Ives was using the "1 gauge" which consisted of two rails 1.75 inches (44.45 mm) apart. This gauge had originally been introduced by Marklin and is the same width as the modern "G" gauge. Lionel, however, chose to build most of its trains in a new gauge that it created and called "wide" or "standard" gauge. Standard gauge rails were slightly farther apart at 2.12 inches (53.975 mm). 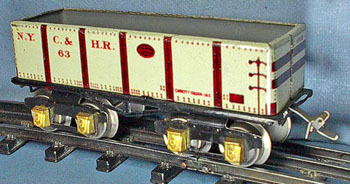 American Flyer used "O" gauge (also introduced by Marklin) which was smaller than either at 1.25 inches (31.75 mm) in width. Although early toy train manufacturers were not too fussy about keeping accurately to scale sizes, this meant that Lionel's trains were slightly larger than either American Flyer's or Ives. Since they were priced very similarly, this meant the consumer was getting a larger train for about the same price from Lionel, which was a real advantage for the company when it came to marketing. Lionel's standard scale was, like many early track standards, a three-rail system. This meant that in addition to the two outer rails you would see on a real railroad, the track had a third center rail. Electric trains get their power from the metal rails and require two paths for the electricity to flow through and make a circuit (the paths are often referred to as the "ground" side and the "hot" side). This might seem to make a two-rail system ideal, where one track was ground and the other hot, but in reality this arrangement often caused problems. In a simple loop the outer track and inner track never met, so there was no danger of a short circuit. If a track is set up so it loops back on itself with a switch, the outer rail meets the inner rail at the switch causing the "ground" and "hot" sides to short out. With a three-rail system the center rail is always the "hot" one and the outer rails are both "ground" so the track could be laid out in any shape and there was never a problem. The disadvantage of the third rail was that it was less realistic, but manufacturers in the toy train market who were selling to kids more than adults thought that having a simple, more durable product was more important than modeling accuracy. It was this competition between Lionel, American Flyer and Ives that led to the association of electric toy trains with Christmas. Lionel founder Joshua Cowen pushed the distributors and stores that carried his products to incorporate them into their Christmas displays, suggesting they would make wonderful holiday presents. This, along with advertisements featuring Lionel trains around Christmas trees, sealed the connection. 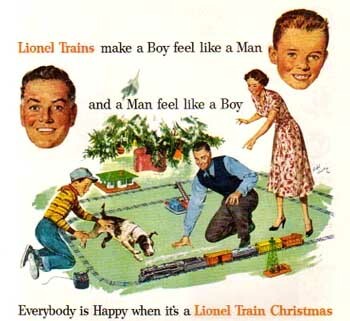 In addition to selling through the Christmas ads, Lionel also used negative advertising to disparage its competition. Its ads compared the durability of its tin-plated cars to the Ives' cast iron cars by dropping both to the floor. In the advertisement the cast iron toy was shattered into 15 pieces while the Lionel car got just a couple of dents. However, unmentioned in the ad was the fact that they were demonstrating Lionel's best product line against Ives' cheapest. Both American Flyer and Ives decorated their cars by using lithographic printing. This allowed the metal surface to have many painted-on details. The process was expensive, however, and to save costs Lionel only painted theirs two solid colors. Cowen turned this perceived deficiency into an advantage by using bright and unrealistic colors on his trains. When asked why Lionel did that Cowen replied that the majority of train sets were purchased by mothers for their children, and the bright colors attracted women buyers. Ives sales were suffering under Lionel's advertising onslaught, so in an attempt to combat Cowen's competition, Ives dropped their 1 gauge trains and added standard scale. This came too late, however, and the company went out of business in 1928. American Flyer and Lionel purchased the company and operated it jointly, putting their own labels on the trains. A few years later, however, both Lionel and American Flyer were suffering from the economic devastation of the Great Depression. Iin an attempt to cut costs, Lionel dropped its standard gauge products and went to O gauge. The smaller size of the trains would mean less materials and lower costs. American Flyer, which had switched to standard gauge to compete with Lionel, was also forced back to O. Another Lionel Christmas ad showing some of the trains and accessories available in 1950. (Courtsey of Lionel LLC). The depression was not uniformly bad news for toy companies, however. In 1919 Louis Marx founded his company and it grew significantly despite the poor economic environment. In1934 Marx would purchase Joy Line trains and start selling them under the Marx label. As the years went on both Lionel and American Flyer would find Marx to be stiff competition at the lower-priced end of their product lines. In the late 40's and early 50's as America emerged from World War II to a booming economy, the toy train business did well. 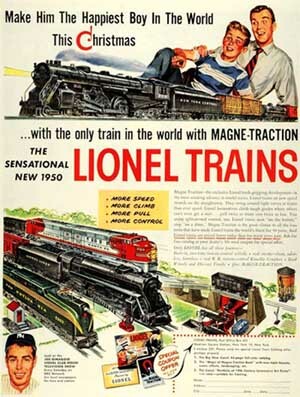 This was perhaps the golden era for Lionel and it introduced many new trains and accessories. The old tin-plated trains were mostly gone and replaced by plastic. Plastic, though not as durable, could be poured into molds. This allowed for more detail on a cheaper product. 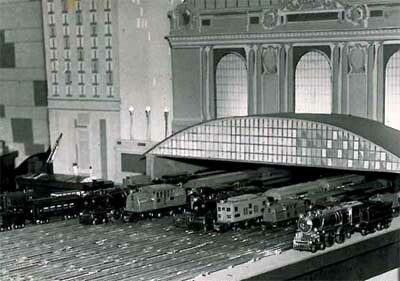 Lionel introduced many innovations and accessories for its trains. You could change the track your train took by pulling a lever and electrically changing a remote switch. You could pull your coal car up to a receiving yard, press a button and it would dump its load. You could then move the train to a coal loader and have the car refilled. You could split your train in two by driving over a special track with a built-in electromagnet and pressing an "uncouple" button. If you bought the automatic switchman he would jump out of his shack and wave his lantern at the engineer as the locomotive went by. There were accessories that would take barrels off cars and others that would put milk cans onto cars. There was a military car that fired rockets at a box car that exploded when it was hit. Another one would launch a helicopter into the sky. There was even a flatcar that would deliver a NASA-style missile to a launch pad with retractable gantry. The whole time that the toy train business had been developing a second marketplace, aimed at adults, had also been getting underway. The hobby of model railroading, where enthusiasts were more concerned about building an accurately running railroad and less about toy-like gimmicks, started gaining adherents in the years before WWII. These adult hobbyists demanded that their trains be much more realistic. German toymakers pioneered this market and introduced a gauge roughly half the size of O with the tracks 0.650 inch (16.5 mm) apart and named it HO (for "Half O"). Not only were the smaller trains cheaper, the smaller scale also allowed modelers, who were often interested in building features like scale-sized mountains and rivers, to fit much more scenery in a given area. Most versions of HO that appeared were also two-rail systems making the gauge more realistic. By the 1950's HO and model railroading were becoming increasingly popular with Americans, a trend noticed by both American Flyer and Lionel. This led both of these manufacturers to try and increase the realism on their own trains. American Flyer dropped their O gauge line completely in 1947 and began manufacturing a two- rail standard, slightly smaller than O gauge called "S" (Not to be confused with the older standard gauge). Lionel was too highly invested in three-rail O gauge to make such a radical change, however, (though they did add a line of HO products). In 1957, in attempt to make O more authentic, Lionel introduced Super-O track. This new version of O kept the center rail but minimized its appearance by employing a thin strip of copper just wide enough to allow for electrical contact. The tracks also used more lifelike brown-colored plastic sleepers spaced realistically apart. 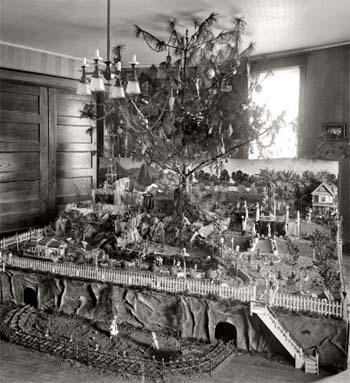 This Christmas home display from the 20's shows how early the idea of toy trains was linked with the holidays. The increasing interest in model railroading was also coupled with a decline in fascination in toy trains by children and teenagers. Lionel and American Flyer's attempts to get into the model railroading market were too late and by the late 1950's both businesses were losing money. A.C. Gilbert Co., which owned American Flyer, went bankrupt in 1966. Lionel purchased the rights to the American Flyer name in May of 1967, though Lionel itself was far from financially stable. Only four months later, Lionel went bankrupt. This wasn't quite the end of electric Christmas trains, however. 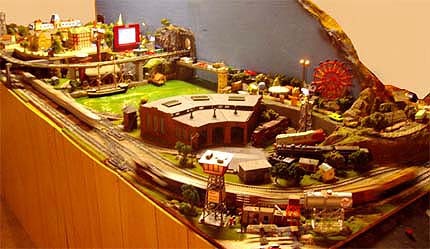 By the 1980's and 90's the baby boomers who had grown up with O gauge toy trains were nostalgic for them. A collectors market soon developed with authentic Lionel and American Flyer trains going for many times their original cost. A new company bought the rights to the Lionel name and began producing many of the historic products from the old molds and tooling, in addition to introducing new lines. It is even possible today to purchase replicas of the earliest tinplate models from the 1920's era running on Standard Gauge track. G gauge, an updated version of the 1 gauge, has also become extremely popular. Though it is a favorite of those who enjoy outdoor "garden railroading," increasingly it has become a popular scale for putting a loop around the Christmas tree. Even HO, which is by far the most popular scale for railroad modelers, has been able to make inroads in the Christmas train market. For years it was very frustrating to try and put a simple loop of HO on the carpet around your Christmas tree. The tracks were designed to be nailed down to a hard surface and a soft rug would easily cause derailments. Manufacturers eventually solved this problem by creating an integrated roadbed with a mechanism that allows the track to snap together. This approach allows HO trains (and even N gauge trains, which are half as small as HO) to run on a carpeted surface. So it looks like the electric trains of Christmas will continue to be a secure tradition for many years to come.